Buildings older than the United States, cheap flights from country to country, history at your fingertips—Europeans have access to some pretty awesome things. Now, it looks like the European Kia Optima GT sedan has been added to that list. With a variety of changes from the American-market Optima, Kia’s newest addition to its European lineup will make you wish you lived on the Old Continent. The Korean carmaker didn’t release a large amount of details when it unveiled the Euro-spec Optima GT at the Frankfurt Motor Show. What we do know is that this high-powered vehicle will be developed exclusively for Europe—and the likelihood of the United States’ market seeing it isn’t that great. A 2.0-liter turbocharged gasoline engine powers this powerful sedan and offers 260 lb-ft of torque. 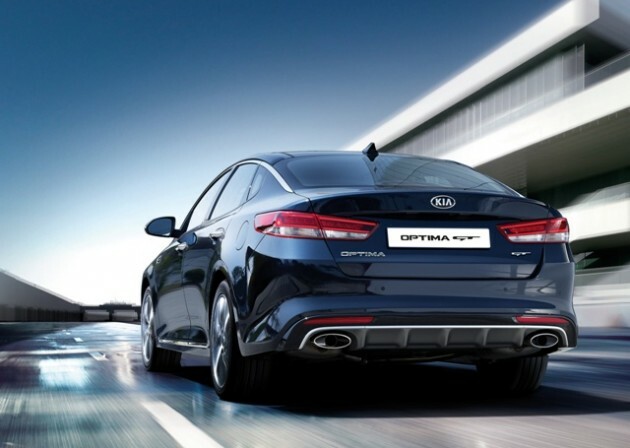 A six-speed automatic transmission, stiffer suspension, and plenty of visual updates come together to give the Optima GT a sportier feel, making it perfect for those consumers looking for a practical, yet performance-oriented sedan. In terms of looks, the Optima GT looks very similar to the leaked photos we saw earlier this summer. While the Optima GT’s European launch date has yet to be set, the European-spec Optima is set to go on sale before the end of the year. It’s likely the GT will arrive at dealerships around that time, too.